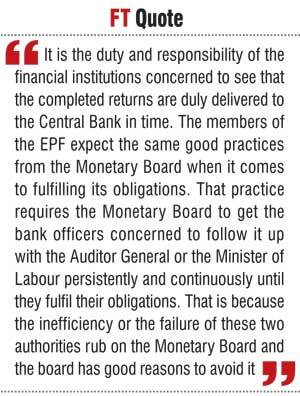 Home / Columnists/ Central Bank’s clarification on EPF has unwittingly refuted Prime Minister and Minister of Finance? Central Bank’s clarification on EPF has unwittingly refuted Prime Minister and Minister of Finance? The Central Bank has issued a clarification, carried by Daily FT in its print edition of 1 February 2016, on the Monetary Board’s alleged failure to publish the annual reports of the EPF after 2012, a concern raised by this writer in a previous article in this series. This alleged failure has been only one of the concerns raised in the article under reference among many failures of the Monetary Board in the recent past as the trustee of EPF (available at: http://www.ft.lk/article/520800/EPF-and-ETF--Should-or-shouldn-t-they-be-merged-into-a-separate-institution?). Thus, the bank has been very selective in making its clarification and defensive in its tone. Yet, it could be considered a good sign since it displays the bank’s willingness to engage itself in an exchange with the public concerning its role in EPF. Thus, the Monetary Board has been given extraordinary powers with respect to investments in EPF. As it transpired in the Parliamentary debates on the draft EPF Bill in 1958, the government did not have any other public body except the Monetary Board of the Central Bank with which it could place the savings of the working people of the country with confidence. Due to this reason, the Monetary Board has to be extra alert about its functions relating to the EPF. 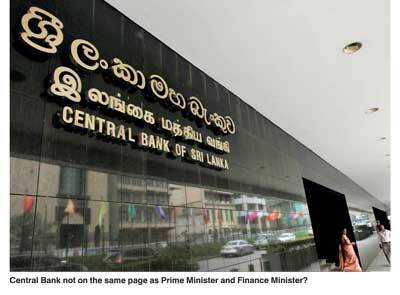 This writer took up this case and requested the Monetary Board to quit these financial institutions as quickly as possible in a previous article in this series (available at: http://www.ft.lk/article/387913/EPF-should-exit-banking-sector-and-Central-Bank-should-leave-private-banks-in-private-hands). Since these investments are still held by the EPF, the current Monetary Board appears to be enjoying the bad practice more than ever. The Monetary Board has invested EPF funds in several bankrupt or low performing companies. Examples are PC House, Eden Hotels, Hyatt Regency and Sri Lankan Airlines. In the financial institution sector, it has also invested in the Finance Company with full knowledge that it was a bankrupt company. In the case of Hyatt Regency, the Monetary Board has invested Rs. 5 billion which money has not delivered any return to EPF members so far. With a massive fraud in the Hyatt Regency as revealed in a forensic audit conducted in mid 2015, it is likely that the case will be referred to law enforcement authorities and the Monetary Board too would be made answerable in a litigation (available at: http://www.dailymirror.lk/78149/hyatt-heist). Clearly, the Monetary Board has burned its fingers and dented its reputation with these investments. The reports circulating in the market today about the investments of the EPF are also not very salutary to the Monetary Board (See reports at http://www.sundaytimes.lk/160131/business-times/epf-back-to-old-games-180942.html; http://www.economynext.com/Sri_Lanka_overnight_markets_recover_from_moral_suasion-3-4032-3.html).